Getting involved in a trade show is a fantastic opportunity for your company to showcase your latest services and products to your core demographic, as well as network within your own industry. However, it’s a very competitive market. To ensure that you walk away with more quality leads than your competitors, we’ve run through our interactive and creative ideas for your exhibition stand below. Keeping your visitor’s attention goes beyond the initial graphical impact of your exhibition stand; you’ll also want to provide a well-thought out experience. People inherently enjoy being entertained. Before you decide on a concept to implement to keep them engaged on your exhibition stand, you’ll want to think about the context. Your timeframe to capture their attention won’t be long, so you’ll want it to be simple and engaging enough to keep it. Visitors are also likely to have been walking around for long lengths of time, and thus their focus may be lapsing. The best executions of interactive ideas are within an exhibiting solution that can build in these features from the get-go to create seamless functionality. Games are fun and a great way of drawing in an audience! “You’ll want the game to increase footfall to your exhibition stand, but it’s also important that they remember your brand and what they discussed on the stand. Not just the game!” says Design Consultant, Emma Battman. To keep on-brand, it’s important that the game relates in some way to your product/services. Totum Sport, a brand that sells hydration sports supplements to make you run faster and hit harder, integrated a “reaction game” live on their exhibition stand. The graphics surrounding the game highlighted this feature, and was tactfully placed near an illuminate product display. Everyone loves a giveaway, and although they’re a common tactic when it comes to exhibiting, they’re still beneficial to draw attention to your exhibition stand and provide an ample opportunity for your social media coverage. 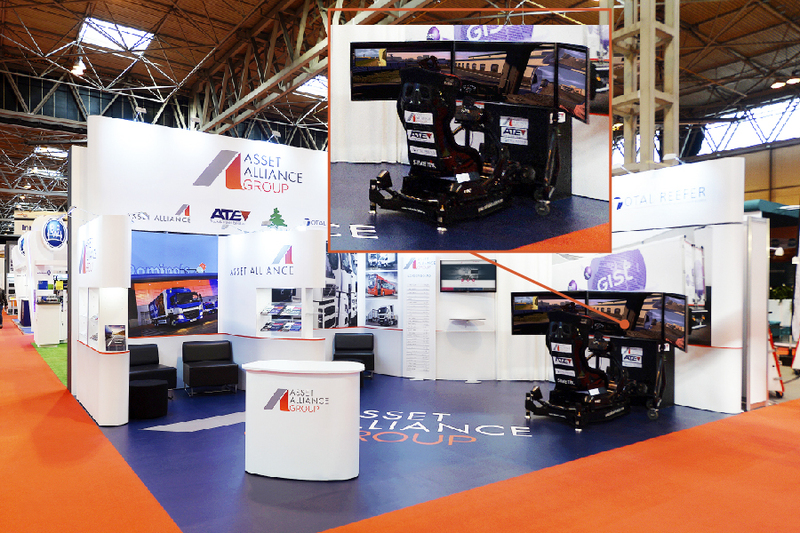 A Prestige Events System exhibition stand can fully accommodate a space to drop a business card, and provide a graphical element around the slot to shout about the competition. “WIN a bottle of champagne”, stylised with an arrow into the drop point or you could even engage further and add a sweepstake element, “guess how many corks in the champagne bottle”. 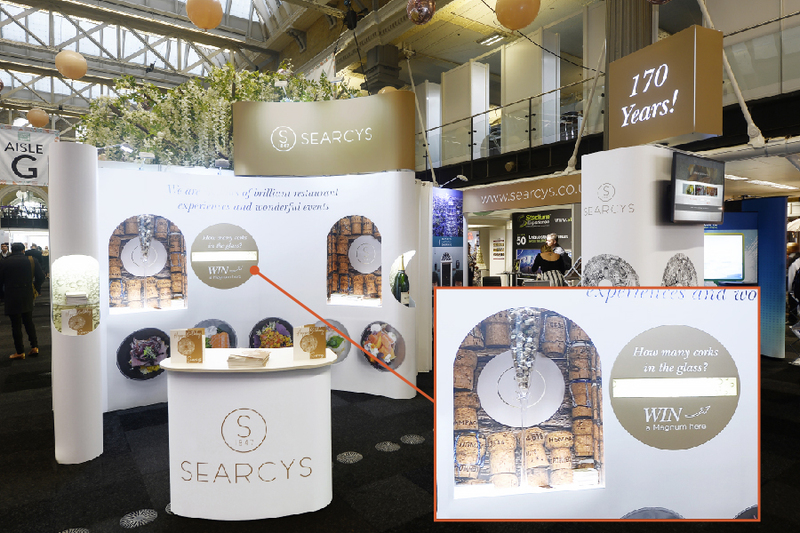 A tactic that Searcy’s used at Square Meal Venues & Events Live 2017 – and bagged exhibition stand of the show! The average trade show attendee spends 5.5 hours at an exhibition, and most of them will thoroughly explore the venue. Think of the strain on their feet! A sit-down area provides a comfortable space on your exhibition stand for any visitor. They’ll get the comfort of a cushioned seat and maybe even a warm cup of coffee and you’ll get the opportunity to strike up a conversation. Our client, YourZone45, had huge success with implementing an informal seating area to their layout; the structure was purpose-built to accommodate the lounging zone and made use of the extra space for brochure displays. Live demos on your exhibition stand are a sure-fire way to grab people’s attention, whilst keeping in mind your show objective. 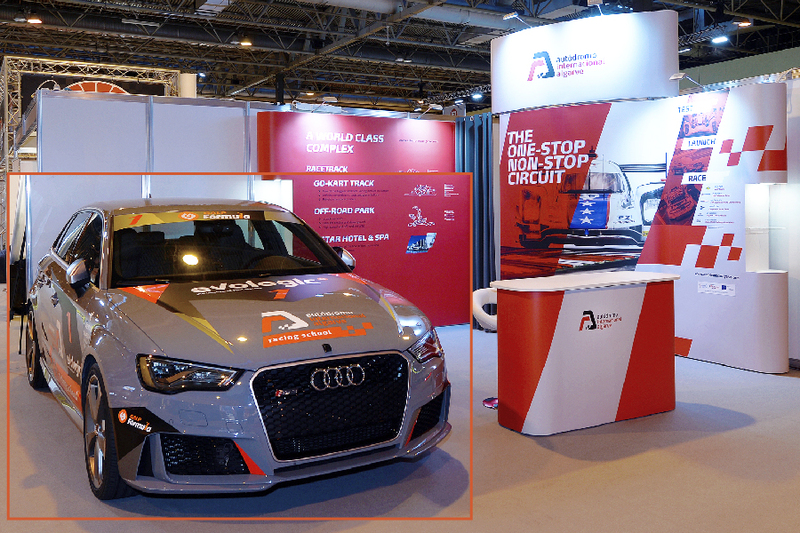 If you work in a sector that boasts interesting products, be sure to build your exhibition stand to accommodate it, whether it’s a car, a big ol’ boat engine or a bunch of mountain bikes! If you’re hosting a product demo, be sure to choose a presenter that will be able to confidently run sessions and naturally incorporate audience interaction to draw more people around your stand. Using the robust and reliable Prestige Events System, TV screens can be fixed at a lower height for the integration of touch screen games. Semi-circle plinths can also be placed underneath regular screens to house a PC and a mouse and keyboard to successfully and comfortably run material relevant to your audience, whether it’s a game or a demo. As well as various TV screens, Tesco Labs also invests in a slew of brackets attached to their counterfixes, or inside showcases, to mount an iPad. Perfect for showing literature, taking product orders and providing a more immersive experience! All of these features demonstrate a good use of space and can be implemented into your exhibition stand from the very beginning concept. By creating something from the get-go, the graphical element of your exhibition stand can be designed to fit the purpose. Want to lead your visitors to a specific point within your stand? Let the photo-flooring take them there. Coupled with good furniture choice, and interactive ideas, you’ll not only catch the attention of your visitors but, more importantly, you’ll keep it. The Quadrant2Design team have designed and built all types of shapes and sizes of exhibition stands, and are well-equipped to support your smaller exhibition stand design with a free design proposal, drop us an email at designteam@quadrant2design.com or call us on 01202 723500 for more information. This article originally appeared on the Quadrant2Design website.